和其他虚拟机产品一样, Hyper-V同样支持各种网络模式, 包括External、Internal和Private, 具体可以参考 Hyper-V Virtual Switch Explained, Part 1, 这里不再阐述. 这一步如果不勾选Allow management operating system to share this network adapter, 那么仅仅创建网桥, 并不会创建一个虚拟网卡(都是指的主机系统上), 从而宿主操作系统也就不能分享这个网络了. c)给虚拟机添加Network Adapter, 并在Virtual switch下勾选刚建立的virtual switch完成配置. 这样就完成桥接配置了, 如果你桥接的网卡是通过DHCP分配的IP, 那么虚拟机里也会相应分配到自己的IP, 相当于主机和虚拟机各有一张物理网卡; 如果是静态分配, 同样的你需要自行配置IP信息方可联网. 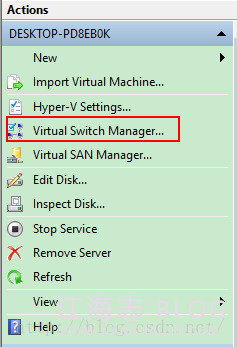 a)打开Hyper-V Manager->Virtual Switch Manager for…->New virtual network switch, 选择Internal类型并完成创建,已经配置过的同样可以忽略. b)和桥接一样,给虚拟机添加Network Adapter, 并在Virtual switch下勾选刚建立的virtual switch完成配置. 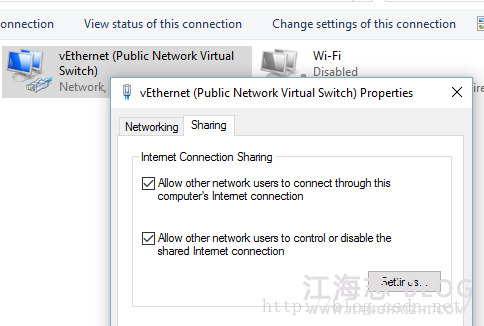 c)右键右下角的网络图标Open Network and Sharing Center即打开网络与共享中心->Change adapter settings, 或者通过控制面板打开路径Control Panel\Network and Internet\Network Connections. d)找到并右键你的联网网卡->Sharing->勾选Allow other network users to connect through this computer’s Internet connection, 并在下方勾选刚刚建立的virtual switch(如果可选), 这时候刚刚建立的virtual switch的IP地址应该变为192.168.x.1, 子网掩码255.255.255.0, 网关为空, 说明windows已经帮我们完成了路由配置. e)由于网络共享需要Firewall服务, 如果上一步失败了检查Firewall相关服务是否正确启动.如果你桥接过你的联网网卡, 那么此处”你的联网网卡”指的是那张启用了Ipv4的网卡, 比如vEthernet(External Network Virtual Switch). f)打开虚拟机, 正常情况下应该能够通过DHCP自动获取到IP, 如果失败了(获取到169开头的IP), 请检查之前的步骤, 或者尝试手动配置虚拟机的网卡IP地址为192.168.x.2或异于1的值, 子网掩码255.255.255.0,网关192.168.x.1, DNS填192.168.x.1或者建议从主机网卡抄过来.